You don’t want to waste anyone’s time – neither respondents’ nor your own. So why ask people to answer irrelevant questions? 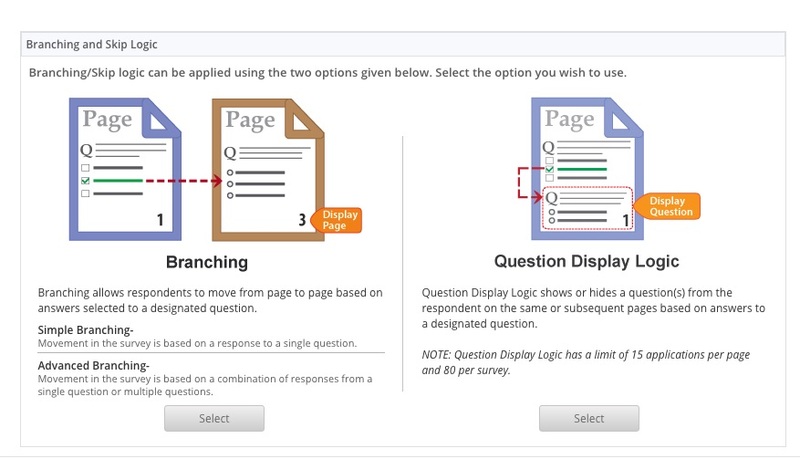 Instead, use question display logic to show survey respondents only the questions that pertain to them. It isn’t always necessary to ask all respondents every single question. Sometimes, doing so wastes time and muddies your data collection. For example, let’s say you’re running a survey about fast food restaurants. You ask, “Have you ever eaten at McDonald’s?” If the participant answers in the affirmative, it makes sense to ask, “Which of these McDonald’s items do you order most often?” So far, so good. But if the respondent has never purchased a meal at McDonald’s, why ask for a favorite item? If you insist on an answer, the respondent will choose one at random, making your data less trustworthy. At best, the survey could include an option to account for the “I never eat here” responses — and then you need to find ways to work around those “Nevers” when you analyze the results. Plus, every researcher wants to minimize the time respondents spend on a survey. It’s silly to waste someone’s time answering an irrelevant question (particularly when you multiply that time by hundreds of respondents), and it can irk people enough to make them quit. In other words: Don’t ask dumb questions. The obvious solution is to control the survey flow, so that respondents are only asked about favorite McDonald’s food items if they eat at McDonald’s. With a good online survey tool – by which, of course, I mean SoGoSurvey – you have several ways to control survey branching, sometimes called skip logic. The simplest way to do this is to show-or-skip an entire survey page based on answers to a single question (“Have you purchased flowers online?” where the YES answer directs respondents to a page full of questions about their buying experience) or based on the answers to multiple questions (the secondary page is shown only if the respondent purchased flowers online and is female). Everyone else jumps over that buying-experience page – invisibly, from the respondent’s point of view; they don’t know that page exists. Are you willing to volunteer? If yes, please provide your email ID. Did you use the free version before signing up for a paid subscription? If yes, what influenced your decision to sign up for a paid version? How much would you expect to pay for the type of widget we just described? If respondent selects any of the three more-expensive choices, ask a question about payment options. How did you learn about our service? If the answer chosen is “referral,” show a text box to ask for the referral’s name and email ID. For these situations, consider using question display logic, which shows or hides questions on the same or subsequent pages based on answers to a designated question. Design your survey the way you ordinarily would. Include all the questions that you intend to display only under given circumstances. Working in the Design section of SoGoSurvey, from the Question Manager look at the top right, and choose the Features drop-down. Choose Branching/Skip logic, which gives you a choice of branching or skip logic. For this case, choose the latter option. In this example, we want to ask people who upgraded a subscription about their reasons for doing so. If they didn’t upgrade, avoid asking for reasons that don’t exist. 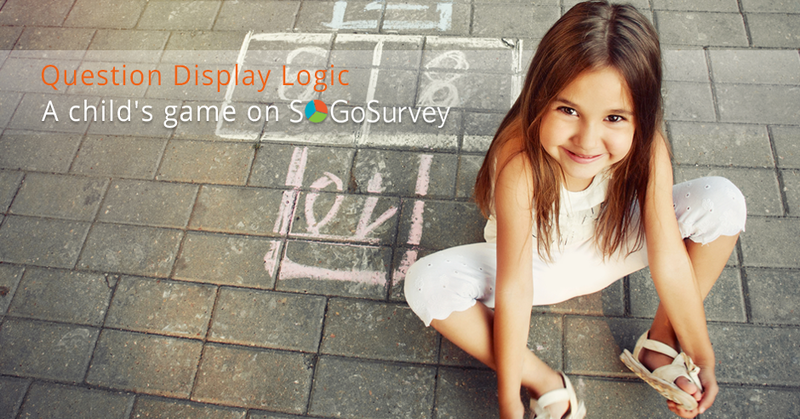 Choose the “show-hide” question – that is, the question that SoGoSurvey displays if the conditions are met. (Think of it as the “THEN” answer to the “IF” that follows.) For this example, it’s the “Why did you upgrade?” question. Then identify the question that controls whether the “why?” question is shown: Did you upgrade? Also mark the answers that should make the question display (e.g. yes, I upgraded). You can test the results in preview mode. 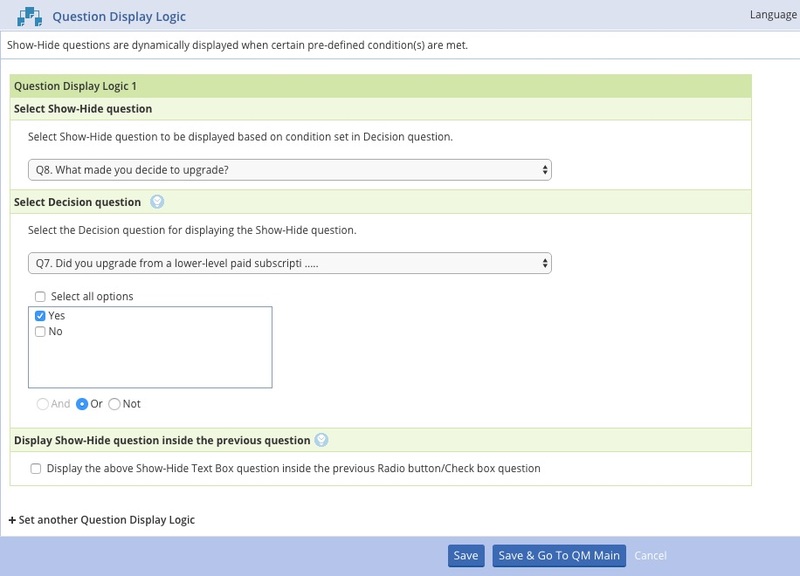 When you choose “Yes” as an answer for the criteria question, the show-hide question displays. Click on “No,” and it goes away. It’s possible to get “fancy” with this feature, such as displaying the follow-up question inside the criteria question, but the basics are powerful enough. Certainly, using Question Display Logic makes the survey shorter and more relevant to the respondent!